This article is about the men's tournament. For the women's tournament, see Women's Cricket World Cup. For the upcoming tournament, see 2019 Cricket World Cup. For the Twenty20 tournament, see ICC T20 World Cup. The first multilateral competition at international level was the 1912 Triangular Tournament, a Test cricket tournament played in England between all three Test-playing nations at the time: England, Australia and South Africa. The event was not a success: the summer was exceptionally wet, making play difficult on damp uncovered pitches, and attendances were poor, attributed to a "surfeit of cricket". Since then, international Test cricket has generally been organised as bilateral series: a multilateral Test tournament was not organised again until the triangular Asian Test Championship in 1999. The number of nations playing Test cricket increased gradually over time, with the addition of West Indies in 1928, New Zealand in 1930, India in 1932, and Pakistan in 1952. However, international cricket continued to be played as bilateral Test matches over three, four or five days. Eight teams participated in the first tournament: Australia, England, India, New Zealand, Pakistan, and the West Indies (the six Test nations at the time), together with Sri Lanka and a composite team from East Africa. One notable omission was South Africa, who were banned from international cricket due to apartheid. The tournament was won by the West Indies, who defeated Australia by 17 runs in the final at Lord's.Roy Fredricks of West Indies was the first batsmen who got hit-wicket in ODI during the 1975 World Cup final. The 1983 event was hosted by England for a third consecutive time. By this stage, Sri Lanka had become a Test-playing nation, and Zimbabwe qualified through the ICC Trophy. A fielding circle was introduced, 30 yards (27 m) away from the stumps. Four fieldsmen needed to be inside it at all times. The teams faced each other twice, before moving into the knock-outs. India, an outsider, quoted at 66–1 to win by bookmakers before the competition began, were crowned champions after upsetting the West Indies by 43 runs in the final. India, Sri Lanka and Bangladesh together hosted the 2011 Cricket World Cup. Pakistan were stripped of their hosting rights following the terrorist attack on the Sri Lankan cricket team in 2009, with the games originally scheduled for Pakistan redistributed to the other host countries. The number of teams participating in the World Cup dropped down to fourteen. Australia lost their final group stage match against Pakistan on 19 March 2011, ending an unbeaten streak of 35 World Cup matches, which had begun on 23 May 1999. India won their second World Cup title by beating Sri Lanka by 6 wickets in the final in Mumbai, and became the first country to win the final on home soil. The Test-playing nations qualify automatically for the World Cup main event while the other teams have to qualify through a series of preliminary qualifying tournaments. A new qualifying format was introduced for the 2015 Cricket World Cup. The top two teams of the 2011–13 ICC World Cricket League Championship qualify directly. The remaining six teams join the third and fourth-placed teams of 2011 ICC World Cricket League Division Two and the top two teams of the 2013 ICC World Cricket League Division Three in the World Cup Qualifier to decide the remaining two places. Qualifying tournaments were introduced for the second World Cup, where two of the eight places in the finals were awarded to the leading teams in the ICC Trophy. The number of teams selected through the ICC Trophy had varied throughout the years. The World Cricket League (administered by the International Cricket Council) is the qualification system provided to allow the Associate and Affiliate members of the ICC more opportunities to qualify. The name "ICC Trophy" has been changed to "ICC World Cup Qualifier". Under the current qualifying process, the World Cricket League, all Associate and Affiliate members of the ICC are able to qualify for the World Cup. Associate and Affiliate members must play between two and five stages in the ICC World Cricket League to qualify for the World Cup finals, depending on the Division in which they start the qualifying process. 2011 ICC World Cricket League Division Two: 6 Teams – Top 2 were promoted to the 2011–13 ICC World Cricket League Championship. The third and fourth-placed teams qualified for the 2014 Cricket World Cup Qualifier. The fifth and sixth-placed teams were relegated to the Division Three for 2013. 2011–13 ICC World Cricket League Championship: 8 Teams – Top 2 automatically qualified for the 2015 Cricket World Cup. The remaining six teams qualified for the 2014 Cricket World Cup Qualifier. 2013 ICC World Cricket League Division Three: 6 Teams – Top 2 were qualified for the 2014 Cricket World Cup Qualifier. The fifth and sixth-placed teams were relegated to the Division Four for 2014. It is proposed that in 2019 World Cup, the number of teams participating will go down to 10 and all the teams will play against each other once in round robin format, before entering the semifinals. This would be similar to the one used in 1992 World Cup. The current trophy is made from silver and gilt, and features a golden globe held up by three silver columns. The columns, shaped as stumps and bails, represent the three fundamental aspects of cricket: batting, bowling and fielding, while the globe characterises a cricket ball. The seam is tilted to symbolize the axial tilt of the Earth. It stands 60 centimetres high and weighs approximately 11 kilograms. The names of the previous winners are engraved on the base of the trophy, with space for a total of twenty inscriptions. The ICC keeps the original trophy. A replica differing only in the inscriptions is permanently awarded to the winning team. The tournament is one of the world's most-viewed sporting events. 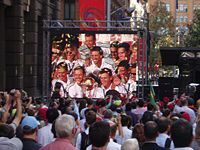 The 2011 Cricket World Cup final was televised in over 200 countries to over 2.2 billion television viewers. Television rights, mainly for the 2011 and 2015 World Cup, were sold for over US$1.1 billion, and sponsorship rights were sold for a further US$500 million. The 2003 Cricket World Cup matches were attended by 626,845 people, while the 2007 Cricket World Cup sold more than 672,000 tickets. The 2015 World Cup Sold over 1.1 million tickets which was a Record . On 13 February, the opening of the 2015 tournament was celebrated with a Google Doodle. ^ England was the sole designated host, but matches were also played in Wales. ^ The England and Wales Cricket Board was the sole designated host, but matches were also played in Ireland, the Netherlands, and Scotland. ^ Cricket South Africa was the sole designated host, but matches were also played in Zimbabwe and Kenya. ^ Eight member countries of the West Indies Cricket Board hosted matches – Antigua and Barbuda, Barbados, Grenada, Guyana, Jamaica, Saint Kitts and Nevis, Saint Lucia, and Trinidad and Tobago. Twenty nations have qualified for the Cricket World Cup at least once. Seven teams have competed in every tournament, five of which have won the title. The West Indies won the first two tournaments, Australia has won five, India has won two, while Pakistan and Sri Lanka have each won once. The West Indies (1975 and 1979) and Australia (1999, 2003 and 2007) are the only teams to have won consecutive titles. Australia has played in seven of the eleven finals (1975, 1987, 1996, 1999, 2003, 2007, 2015). England has yet to win the World Cup, but has been runners-up three times (1979, 1987, 1992). The best result by a non-Test playing nation is the semi-final appearance by Kenya in the 2003 tournament; while the best result by a non-Test playing team on their debut is the Super 8 (second round) by Ireland in 2007. Sri Lanka as a co-host of the 1996 Cricket World Cup was the first host to win the tournament though the final was held in Pakistan. India won in 2011 as host and was the first team to win in a final played in their own country. Australia repeated the feat in 2015. England is the only other host to have made the final, in 1979. Other countries which have achieved or equalled their best World Cup results while co-hosting the tournament are New Zealand as finalists in 2015; Zimbabwe who reached the Super Six in 2003; and Kenya as semi-finalists in 2003. In 1987, co-hosts India and Pakistan both reached the semi-finals, but were eliminated by Australia and England respectively. Australia in 1992, England in 1999, South Africa in 2003, and Bangladesh in 2011 have been the host teams that were eliminated in the first round. Before the 1992 World Cup, South Africa was banned due to apartheid. The Win percentage excludes no results and counts ties as half a win. ^ ICC Cricket World Cup: About Archived 1 June 2013 at the Wayback Machine – International Cricket Council. Retrieved 30 June 2013. ^ Martin Williamson. "The oldest international contest of them all". ESPN. ^ "1st Test Scorecard". ESPNcricinfo. 15 March 1877. Retrieved 28 January 2007. ^ "Olympic Games, 1900, Final". ESPNcricinfo. 19 August 1900. Retrieved 9 September 2006. ^ "The original damp squib". ESPNcricinfo. 23 April 2005. Archived from the original on 16 October 2007. Retrieved 29 August 2006. ^ "The run-out that sparked a riot". ESPNcricinfo. 30 October 2010. Archived from the original on 22 October 2014. Retrieved 18 February 2015. ^ "The low-key birth of one-day cricket". ESPNcricinfo. 9 April 2011. Archived from the original on 19 September 2013. Retrieved 15 July 2014. ^ "What is One-Day International cricket?". newicc.cricket.org. Archived from the original on 19 November 2006. Retrieved 10 September 2006. ^ a b c d e f g h "The World Cup – A brief history". ESPNcricinfo. Retrieved 7 December 2006. ^ a b "The History of World Cup's". cricworld.com. Retrieved 19 September 2006. ^ "50 fascinating facts about World Cups - Part 1". Cricbuzz. Retrieved 21 February 2019. ^ a b "ICC Trophy – A brief history". ESPNcricinfo. Retrieved 29 August 2006. ^ "Cricket World Cup 2003". A.Srinivas. Archived from the original on 25 October 2009. Retrieved 28 January 2007. ^ "1996 Semi-final scoreboard". cricketfundas. Archived from the original on 7 November 2006. Retrieved 28 January 2007. ^ French Toast (2014). Cricket World Cup: A Summary of the Tournaments Since 1975 (e-book). Smashwords. Retrieved 11 December 2014. ^ "Washouts, walkovers, and black armband protests". ESPNcricinfo. Archived from the original on 30 August 2015. Retrieved 30 August 2015. ^ "Ruthless Aussies lift World Cup". London: BBC. 23 March 2003. Retrieved 29 January 2007. ^ "Full tournament schedule". London: BBC. 23 March 2003. Retrieved 22 February 2007. ^ "Australia triumph in a tournament to forget". ESPNcricinfo. Archived from the original on 6 February 2012. Retrieved 15 July 2014. ^ "Bob Woolmer's death stuns cricket world". ESPNcricinfo. Archived from the original on 25 October 2012. Retrieved 4 December 2014. ^ "Bob Woolmer investigation round-up". Cricinfo. Retrieved 6 May 2007. ^ "Australia v Sri Lanka, World Cup final, Barbados". Cricinfo. 28 April 2007. Retrieved 6 May 2007. ^ "No World Cup matches in Pakistan". BBC. 18 April 2009. Archived from the original on 18 April 2009. Retrieved 15 July 2014. ^ a b "India end a 28-year-long wait". ESPNcricinfo. Archived from the original on 25 August 2013. Retrieved 29 October 2014. ^ "Pakistan top group after ending Australia's unbeaten World Cup streak". CNN. 20 March 2011. Retrieved 13 February 2015. ^ a b "Cricket World Cup 2015: Australia crush New Zealand in final". BBC Sport. 29 March 2015. Retrieved 29 March 2015. ^ "World Cricket League". ICC. Archived from the original on 19 January 2007. Retrieved 28 January 2007. ^ "1st tournament". icc.cricket.org. Archived from the original on 17 December 2007. Retrieved 19 February 2007. ^ "92 tournament". icc.cricket.org. Archived from the original on 17 December 2007. Retrieved 19 February 2007. ^ "96 tournament". icc.cricket.org. Archived from the original on 17 December 2007. Retrieved 19 February 2007. ^ a b "Super 6". Cricinfo. Retrieved 19 February 2007. ^ "World Cup groups". cricket world cup. Archived from the original on 26 January 2007. Retrieved 28 January 2007. ^ "About the Event" (PDF). cricketworldcup.com. p. 1. Archived from the original (PDF) on 5 September 2006. Retrieved 2 September 2006. ^ "2015 Cricket World Cup". cricknews.net. Archived from the original on 3 February 2015. Retrieved 3 February 2015. ^ Nayar, K.R. (29 June 2011). "International Cricket Council approves 14-team cup". Gulf News. Retrieved 2 February 2015. 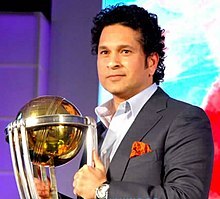 ^ "Trophy is first permanent prize in Cricket World Cup". cricket-worldcup2015.net. Archived from the original on 3 February 2015. Retrieved 9 November 2007. ^ "Cricket World Cup- Past Glimpses". webindia123.com. Retrieved 31 October 2007. ^ "About the Tournament". International Cricket Council. Archived from the original on 25 June 2014. Retrieved 4 December 2014. ^ "Cricket World Cup 2015 3rd Most Watched Sports Event In The World". Total Sportek. 11 January 2015. Retrieved 17 March 2015. ^ "More money, more viewers and fewer runs in prospect for intriguing World Cup". The Guardian. 12 February 2015. Retrieved 17 March 2015. ^ "World Cup Overview". cricketworldcup.com. Archived from the original on 24 January 2007. Retrieved 29 January 2007. ^ "Papa John's CEO Introduces Cricket to Jerry Jones and Daniel Snyder". ir.papajohns.com. Archived from the original on 11 July 2007. Retrieved 4 April 2007. ^ Cricinfo staff (9 December 2006). "ICC rights for to ESPN-star". Cricinfo. Retrieved 30 January 2007. ^ Cricinfo staff (18 January 2006). "ICC set to cash in on sponsorship rights". Cricinfo. Retrieved 30 January 2007. ^ "Cricket World Cup 2003" (PDF). ICC. p. 12. Archived from the original (PDF) on 21 March 2006. Retrieved 29 January 2007. ^ "World Cup profits boost debt-ridden Windies board". Content-usa.cricinfo.com. Retrieved 24 June 2012. ^ "ICC CWC 2007 Match Attendance Soars Past 400,000". cricketworld.com. Archived from the original on 28 September 2007. Retrieved 25 April 2007. ^ "2003 World Cup launched in Soweto". ESPNcricinfo. Archived from the original on 3 December 2014. Retrieved 3 December 2014. ^ "ICC cricket mascot Mello tours Guyana to raise AIDS awareness". UNICEF. Archived from the original on 4 November 2014. Retrieved 4 November 2014. ^ "2011 World Cup mascot named as 'Stumpy'". The Times of India. India. 2 August 2010. Retrieved 16 April 2011. ^ "Asia to host 2011 World Cup". Cricinfo. 30 April 2006. Retrieved 9 February 2007. ^ "The 1979 World Cup in England – West Indies retain their title". Cricinfo. Retrieved 19 September 2006. ^ "The 1987 World Cup in India and Pakistan – Australia win tight tournament". Cricinfo. Retrieved 15 July 2014. ^ "India power past Sri Lanka to Cricket World Cup triumph". BBC Sport. 2 April 2011. Retrieved 17 March 2015. ^ "Cricket Records – Records – World Cup – Result summary – ESPN Cricinfo". Cricinfo. Archived from the original on 27 February 2011. ^ a b "Cricket World Cup Past Glimpses". webindia123.com. Retrieved 31 October 2007. ^ "Statistics / Statsguru / One-Day Internationals / Batting records". ESPN Cricinfo. Archived from the original on 12 September 2015. Retrieved 30 March 2015. ^ "Records / World Cup / Result summary". ESPN Cricinfo. Archived from the original on 27 February 2011. Retrieved 30 March 2015. ^ "Statistics / Statsguru / One-Day Internationals / Team records". Cricinfo. Archived from the original on 11 September 2015. Retrieved 30 March 2015.